Precious things don't have to be valuable things - a shell from the beach or a fossil from the garden can be treasured just as much as objects which have monetary worth. 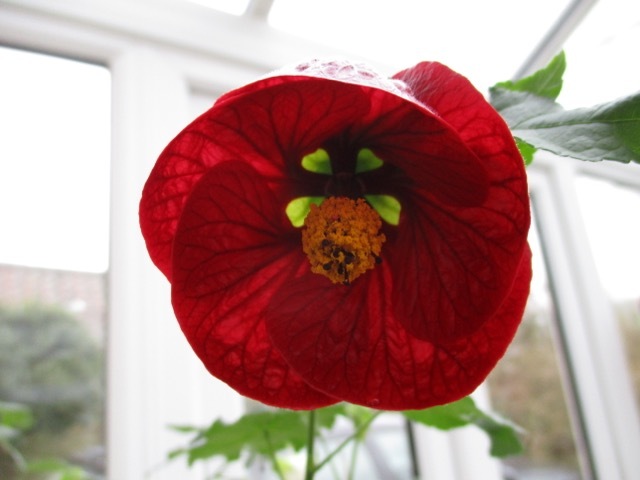 Whilst all plants in the garden are to be nurtured and enjoyed, there are some which are more special than others. Over the last couple of weeks I seem to have picked up more special ones than usual - ones I have been looking for for a long time, or unusual ones which I have been reading about. Sometimes, it is seeing the right plant for a certain place which seems to give it additional value. 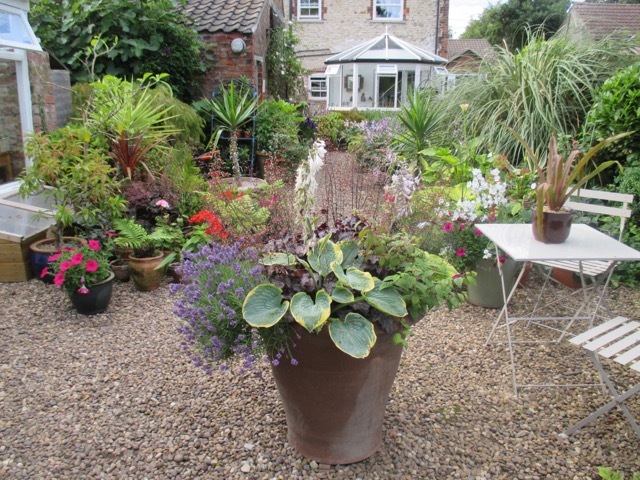 I bought mine over two trips - one to Harrogate Spring Flower Show, and a second to Stillingfleet Nursery, near York. 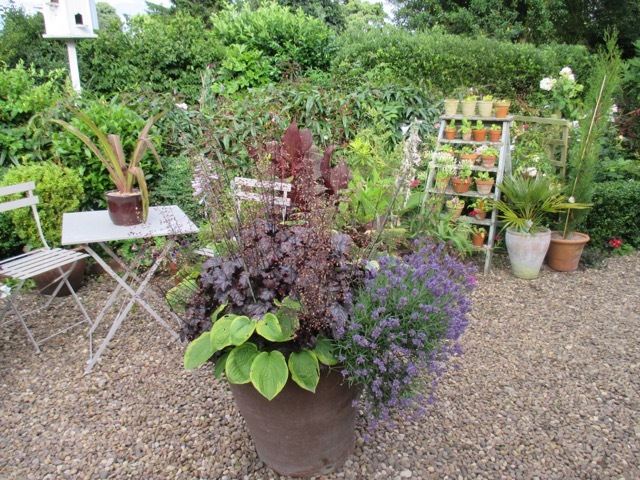 Stillingfleet is essentially a nursery growing unusual perennials and well worth a visit if that is what you are interested in, but as they sell little else, it is a little niche. I absolutely loved it, as I was able to buy plants I have been searching for for a long time. 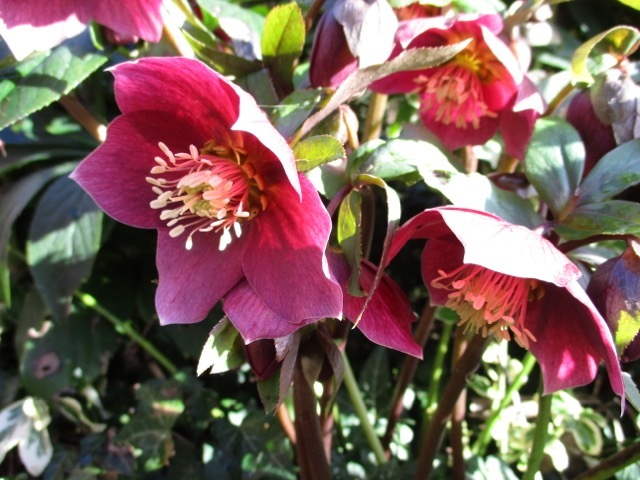 There is a comprehensive online plant catalogue so that you can browse it before your visit. 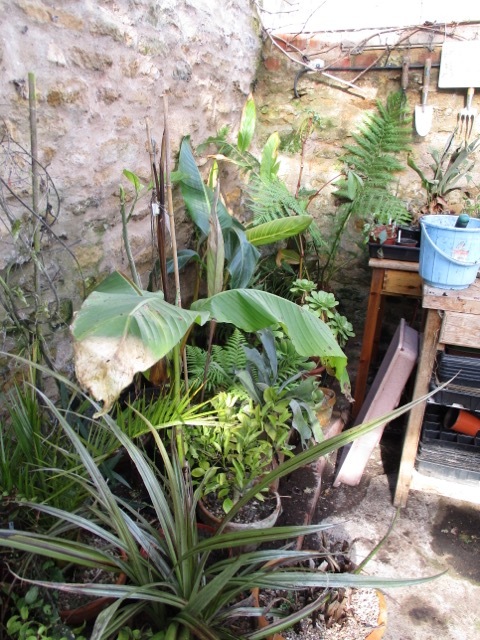 I was impressed by the quality of the plants and by the way they are kept. 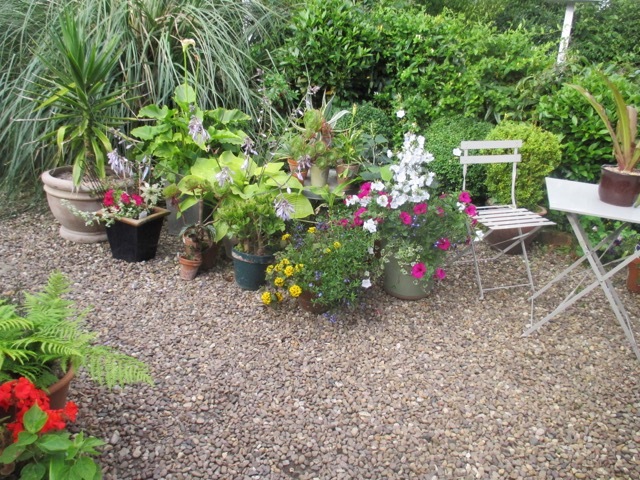 All are watered and weed free - seems pretty basic stuff, but it is surprising how many of the large garden centres can't seem to get that right. 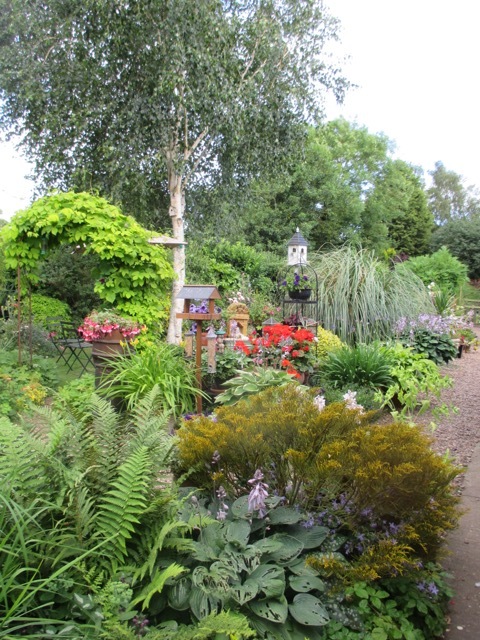 There is an acclaimed garden at Stillingfleet too, but I didn't have time to visit , so will go back later in the season. 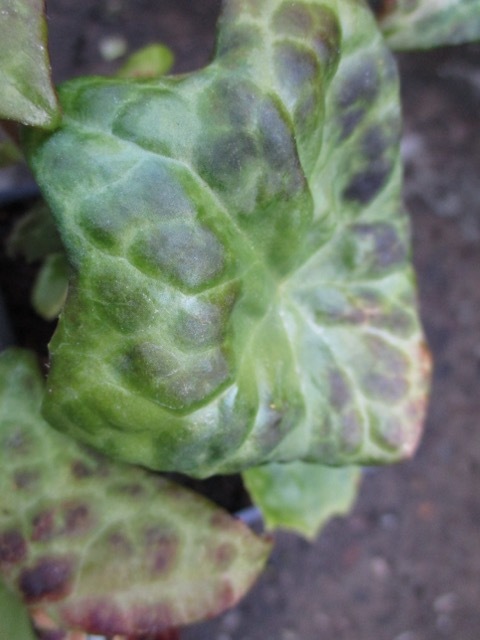 One of the main plants I wanted was Podophillum 'Spotty Dotty', a woodland plant with most unusual foliage. 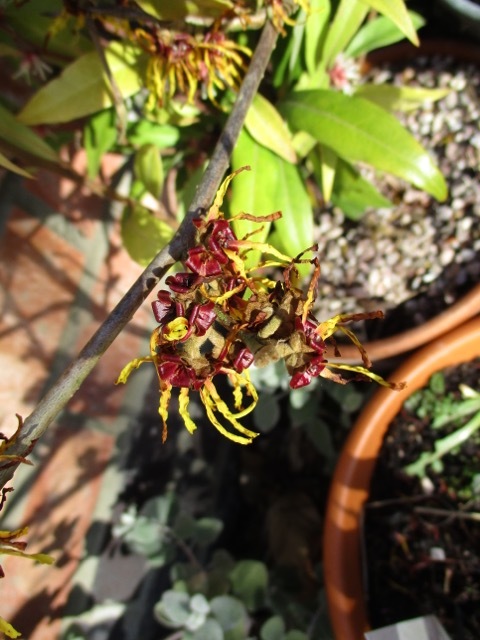 I thought my existing plant had failed to survive the winter, as there had been no sign of it coming through - and it is hard to miss! Of course, the day after I bought my new one, I spotted my initial one steadfastly making an appearance. Oh well, you can never have too may! 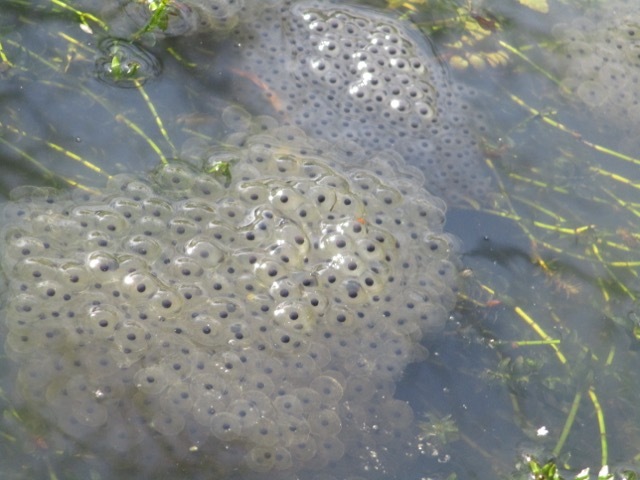 I once read an entry in a plant catalogue where it was described as having "something of the toad" about it, and that is a perfect summary for both colour and texture, and has stayed with me. 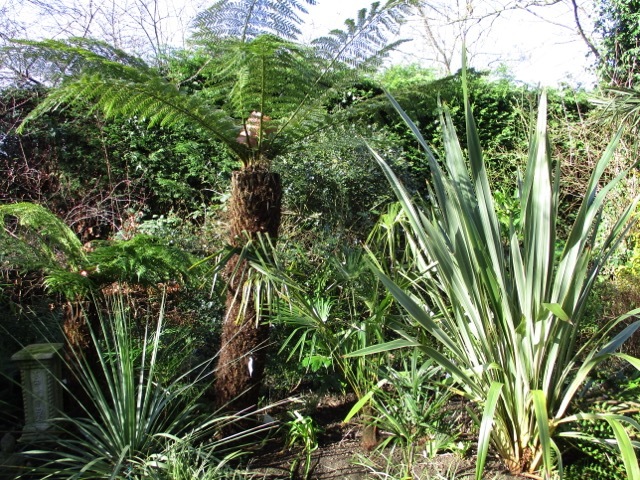 As a woodlander it prefers some shade and also moisture, growing to about 60 cm, with large, mottled leaves. I also fell for the charms of sibling Podophillum Pefltatum, which is a bit of an unknown quantity for me, but a very handsome chap. 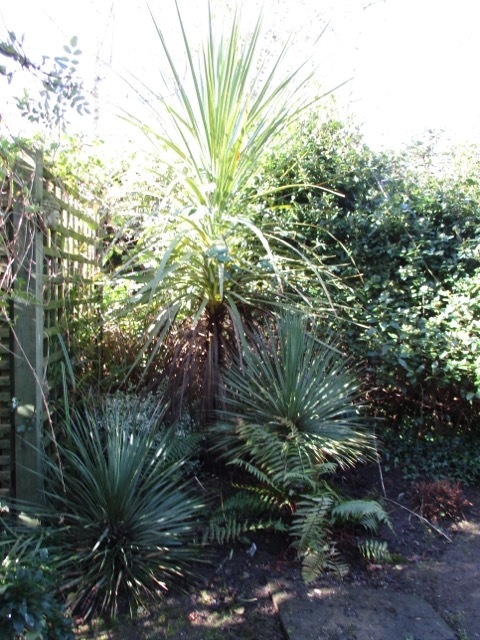 Another woodland plant, enjoying partial shade and moist soil. It is described as 'vigorous'. 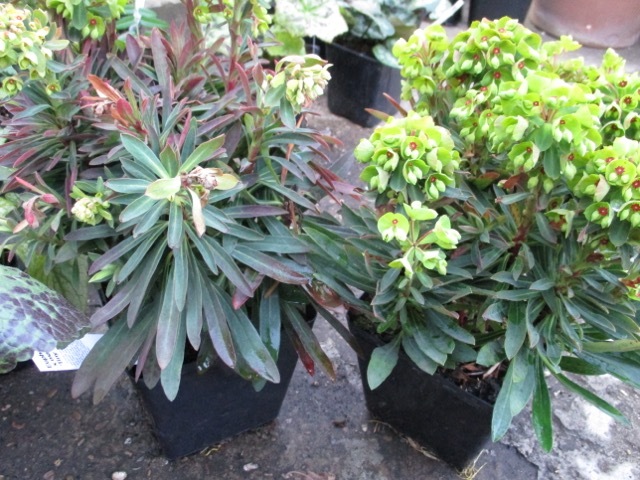 My next little gem is Euphorbia 'Tiny Tim' growing to a lovely compact 30cm. 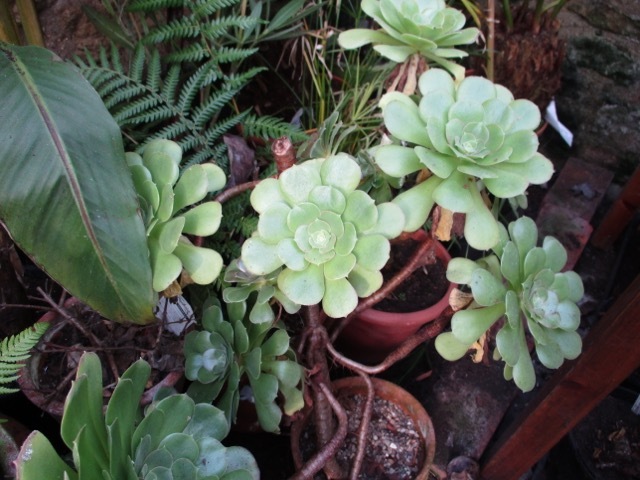 Euphorbias are some of my favourite plants, and, if they do have a fault, it is that they can be large and rangey. 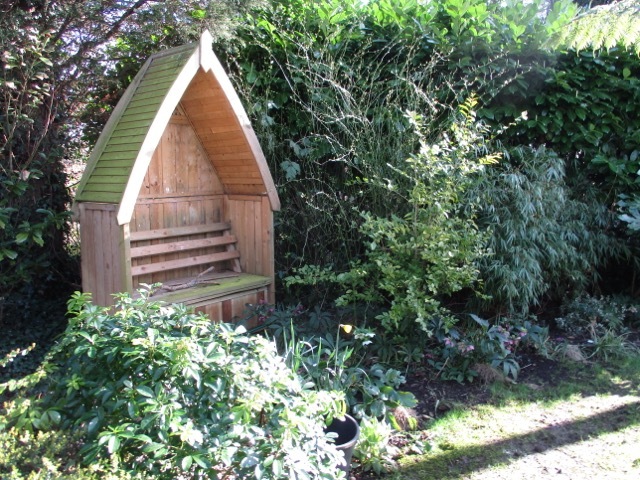 'Tiny Tim' seems like the perfect solution, and I intend to place my two at the front of a border. 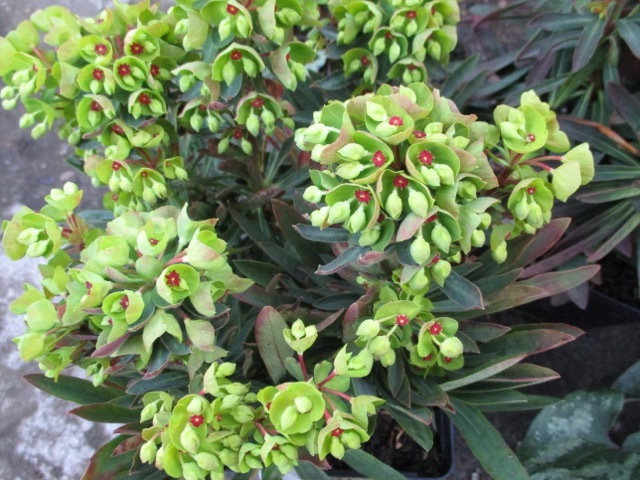 Euphorbias will grow in quite difficult conditions, and will tolerate dry shade which would defeat many other plants. 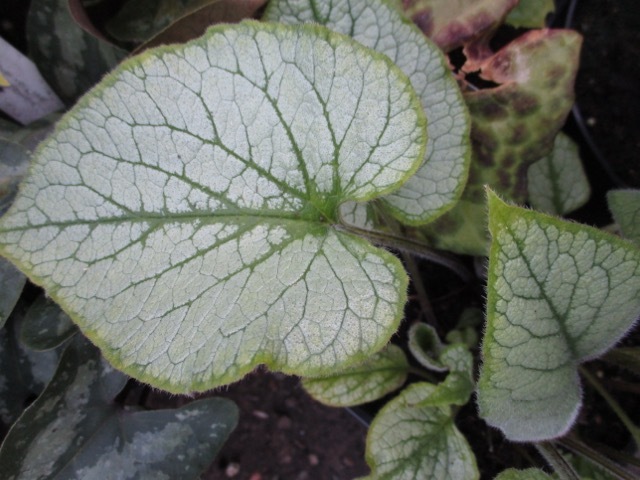 The plant above is new to me, but I fell for the dramatic patterning on the leaves. 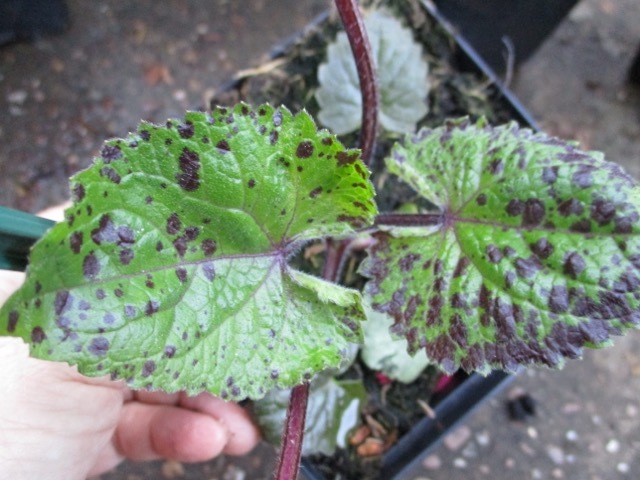 It is Lunaria 'Chedglow' and leaves start off with this chocolate spotting and gradually become darker and darker until it is a dark purple all over, and nearly black just before it flowers. It is, of course, a variety of the old cottage garden favourite Honesty, but certainly much more interesting than any I have grown before. 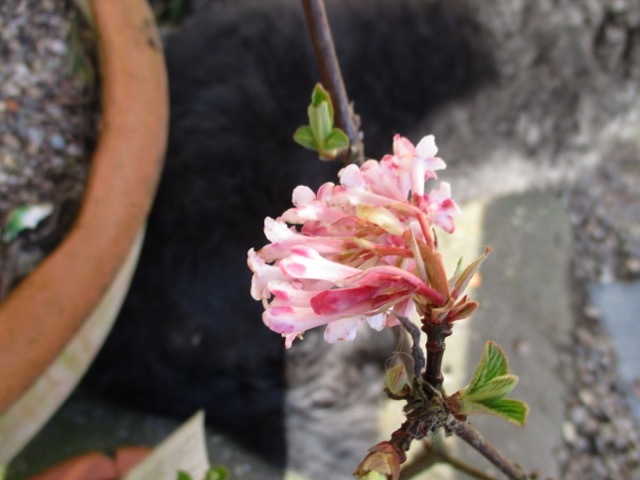 The flowers appear larger than the norm and are a bright lilac colour. It is a biennial and - joy of joys - it self seeds. 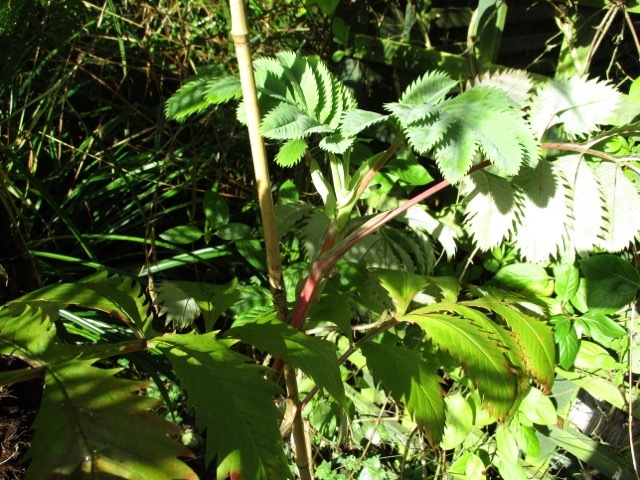 The stems are a pleasing dark red, in contrast to the leaves. Brunnera are just the best plants in the world - they make an appearance early in the year with forget - me - not blue, frothy flowers, and are still there at the end of the season. They give a constant display of the most wonderful, dramatic foliage, whilst the plant itself stays reasonably compact and tidy. 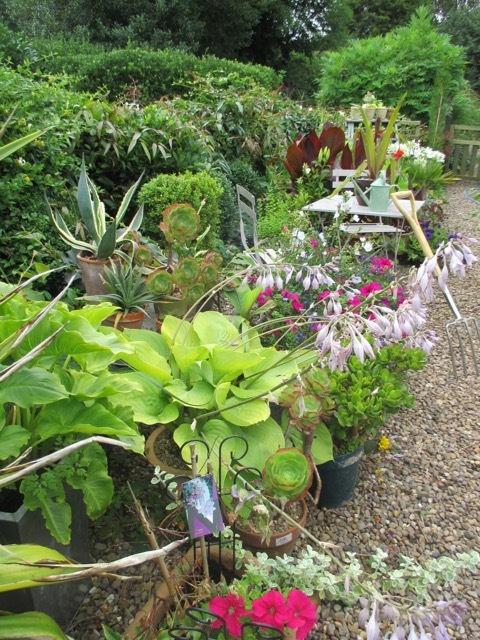 I have tried to get some every year to build up my collection, as they are so useful in every area of the garden. Most of mine are 'Jack Frost', 'Hadspen Cream' and 'Seaheart' , and I welcomed the chance to try some new -to -me varieties. 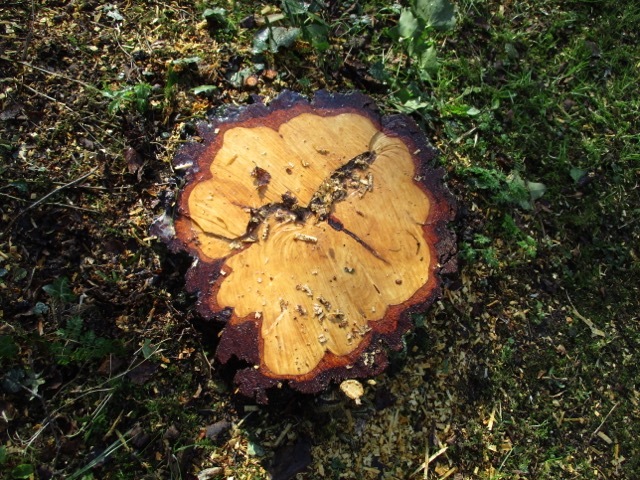 The photo above is 'Jack's Gold', with a green gold edging to the leaves, which fades to silver. 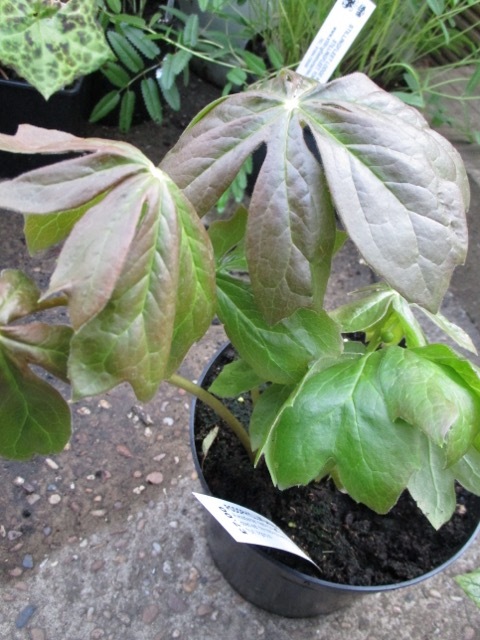 'Looking Glass' is a new introduction, and the leaves grow to be totally silver. 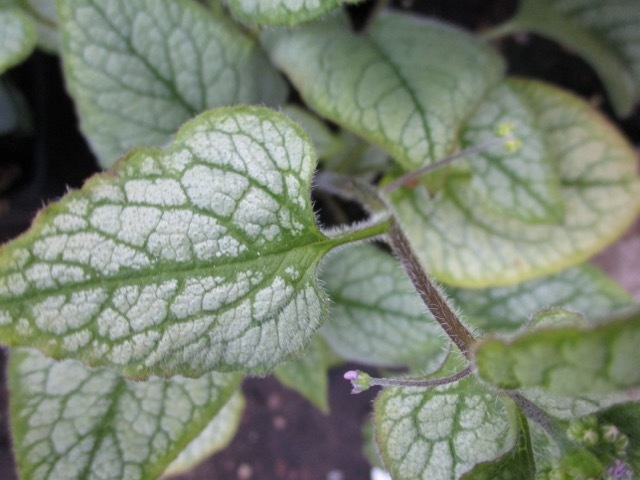 The leaves on brunneras start off really small at the beginning of the season, and grow larger and larger as it progresses. 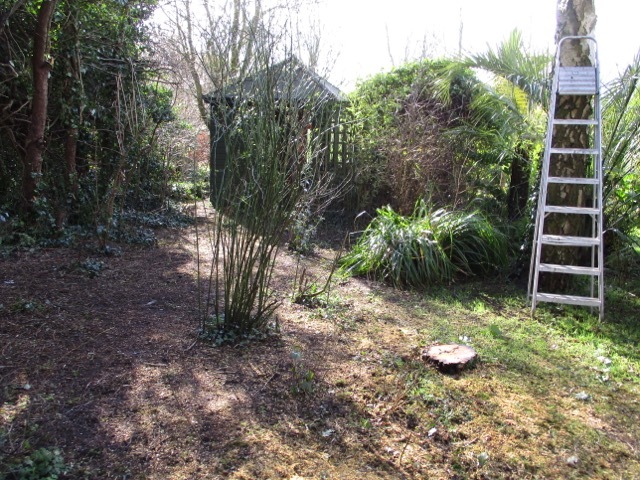 They like cool shade/ partial shade and I have found that they will cope with dry shade, and full sun. They are very easy to please actually, and I have yet to lose one. 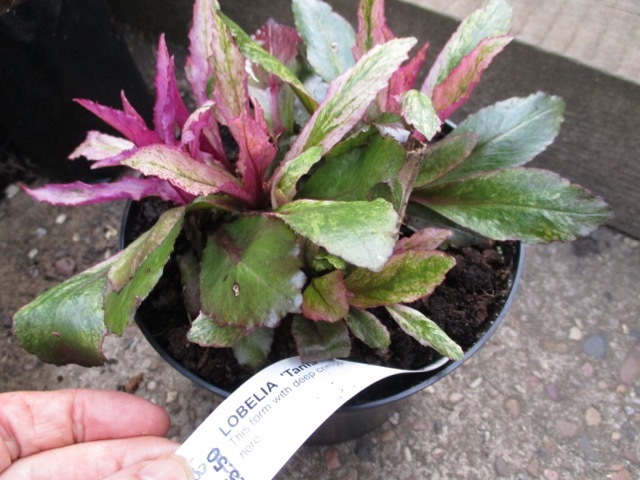 I also found an interesting Lobelia 'Tania', with variegated, pink flushed foliage and deep crimson flowers, growing to about 3' tall. It is reported to be hardy in it's situation just south of York. 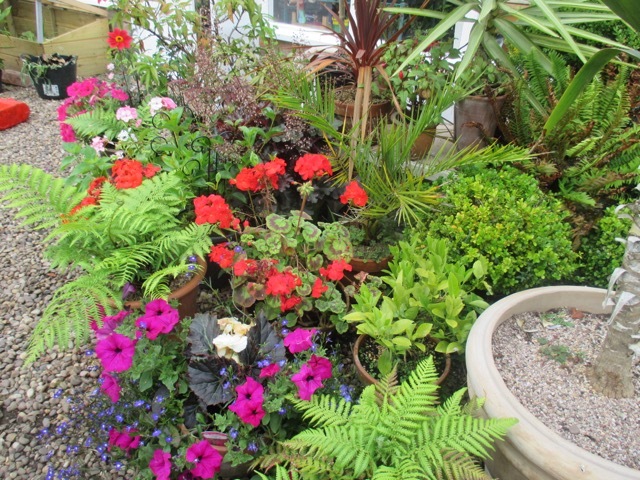 Lobelias are another lovely group of plants worthy of further investigation. 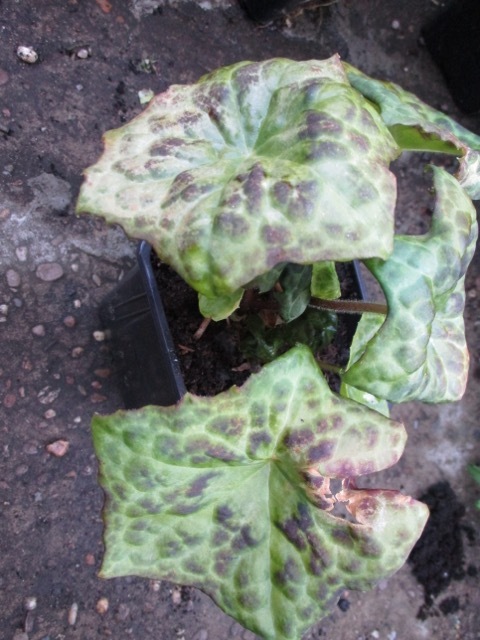 I have read that it needs damp soil in summer, much like L. Cardinalis, but is prone to rotting over winter. 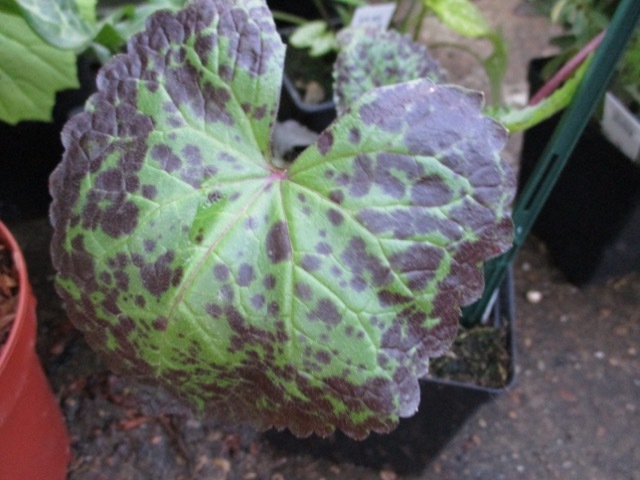 That sounds like a bit of a conundrum, so it may be easier just to overwinter it in a cool greenhouse, ensuring that it is kept drier than in summer. 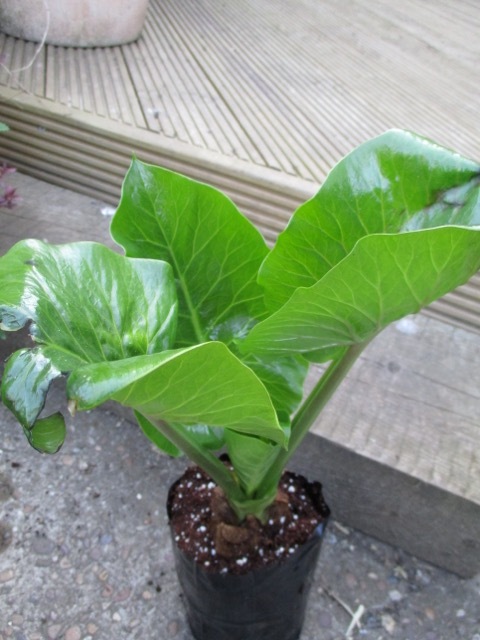 Last treasure is a giant I have been searching for for a while - Cardiocrinum Gigantium. I have tried growing it from seed with zero success! I snapped this up at the Harrogate Flower show, on the stand of a bulb specialist. 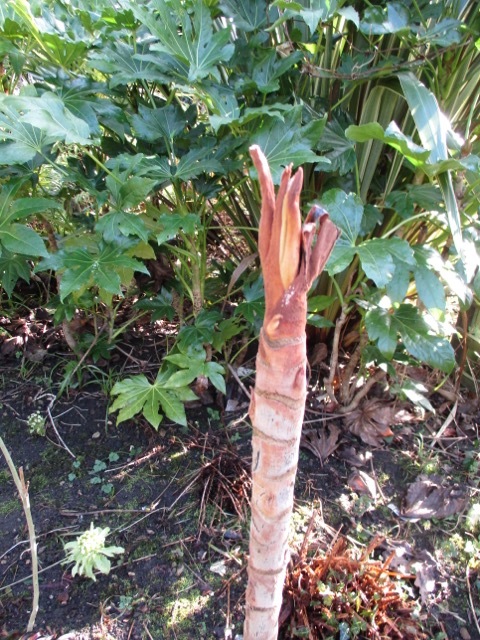 It can grow up to 2.5 m tall and takes around years to flower. 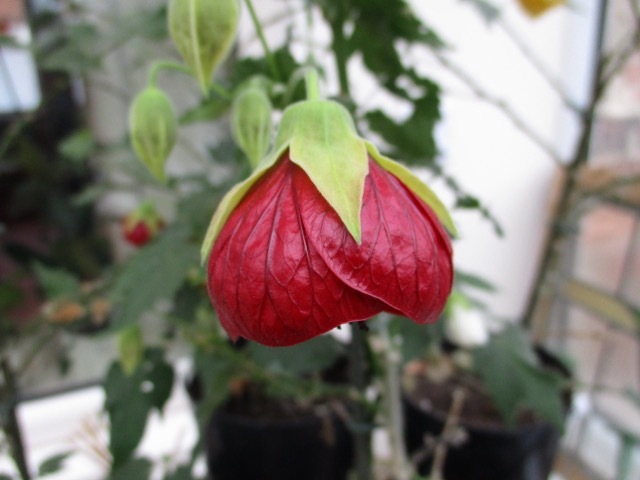 It grows in the Himalayas, so can cope with cool temperatures. It is monocarpic, so dies after flowering. 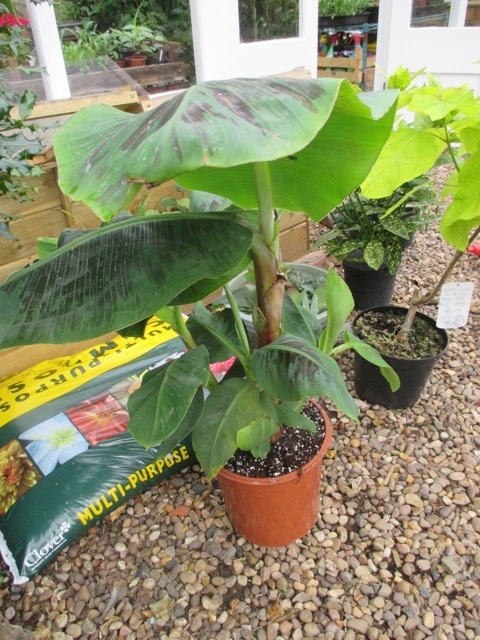 Another interesting plant to grow, although the grower assured me that it is easy to look after and very undemanding. Harrogate Spring Flower Show is held on the Great Yorkshire show ground, which is set in lovely countryside, just off the A1. The show itself is a bit underwhelming as far as the show gardens go, and is more of a showcase for a variety of nurseries and growers, both specialist and main stream. Very enjoyable however, particularly when the sun shines. New plants are always a learning experience, and one which doesn't always end well! Hopefully I can provide the conditions needed to keep my new additions happy and healthy. There are many reasons to be cheerful right now! Cautiously cheerful, perhaps, but still cheerful. There are signs and portents afoot which indicate that spring is on the horizon. 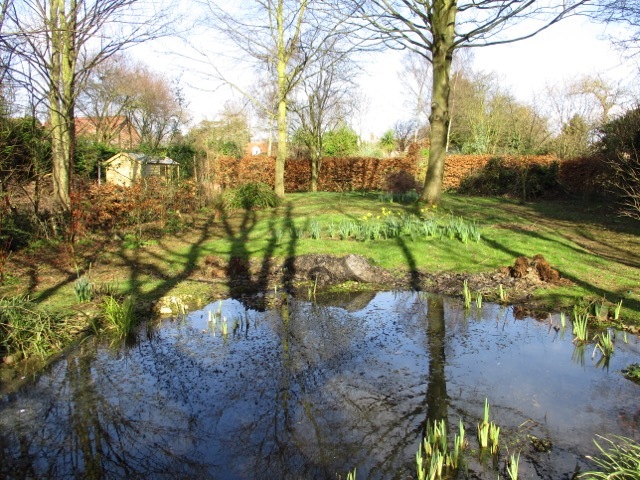 The days are beginning to lengthen, the birds have started singing again, and the bulbs are beginning to appear. 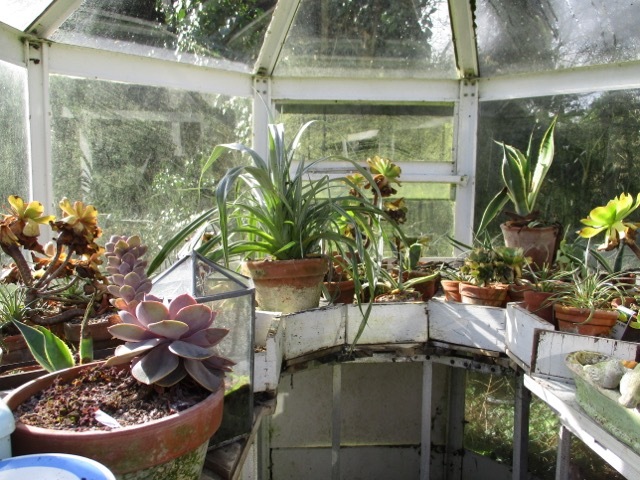 In the conservatory, nobody has told the plants that it is actually winter. 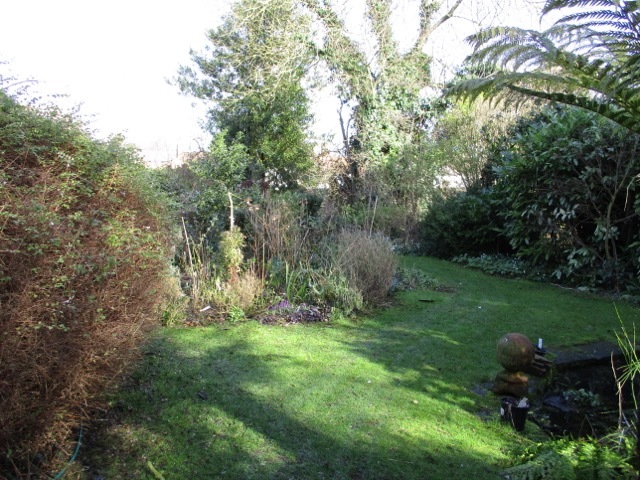 We keep the temperature reasonably low, so I was expecting the overwintering tender plants to remain dormant. 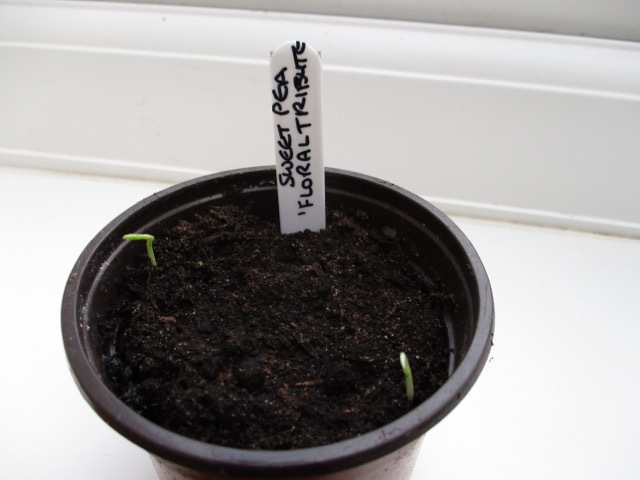 I thought I would keep them ticking over, but that there would be little active growth. What a joy! 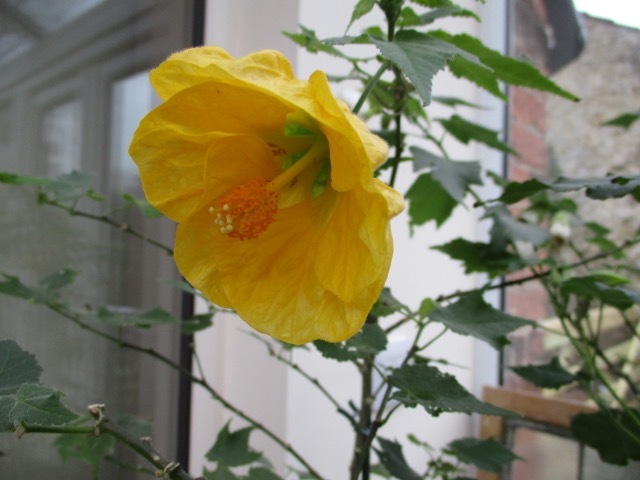 They have not only kept growing, but they have kept flowering too, giving many reasons to be continually cheerful! 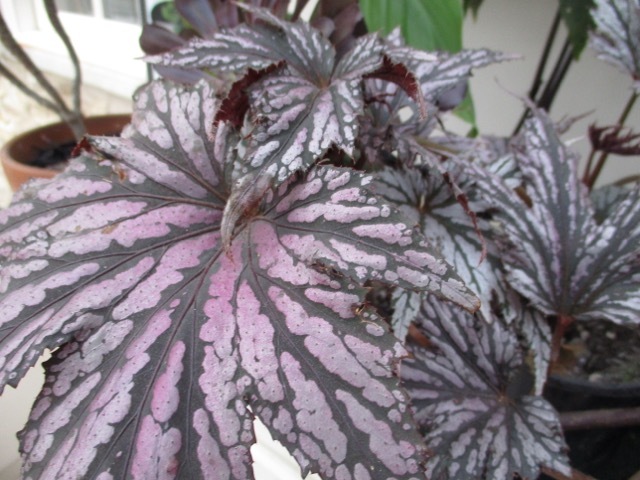 Begonia 'Garden Angels' are putting out lots of new leaves, and the leaves have kept all their wonderful metallic colouring. They will, apparently, stand a couple of degrees of frost, but, as they are quite expensive, I didn't want to chance leaving them in the greenhouse this year. 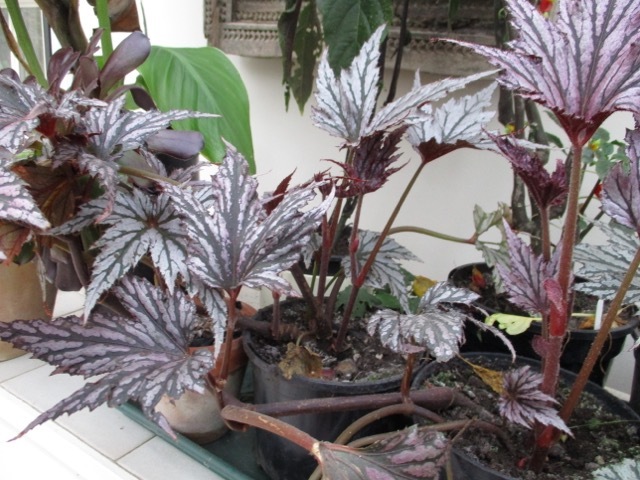 Also, they are every bit as decorative as Begonia Rex, the house plants, and they have given lots of pleasure over the winter. 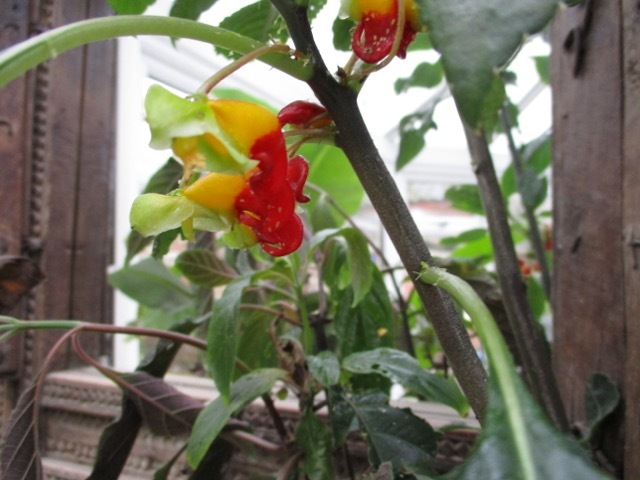 This plant, which is flowering its little socks off, is Impatiens Niamniamensis, the 'Parrot plant'. 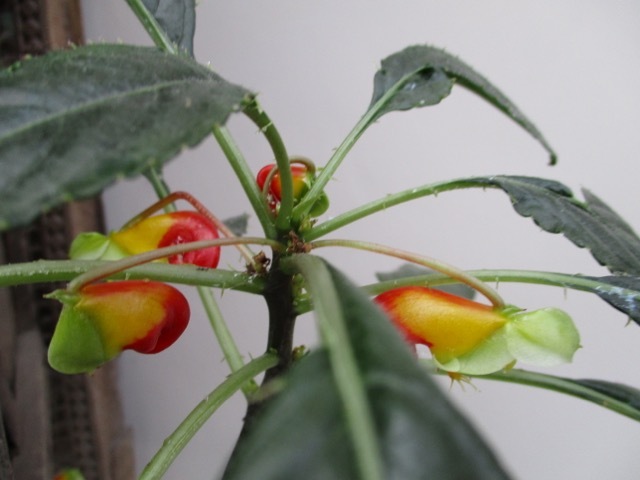 It is easy to see how it got its name, as the flowers certainly resemble brightly coloured parrots, swinging on the stems. 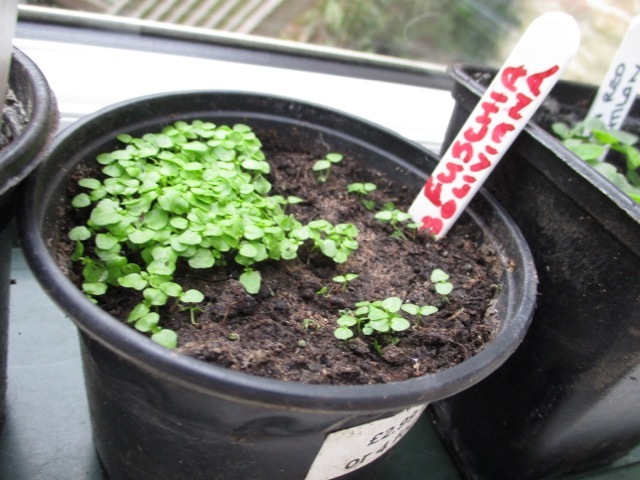 The plant itself can get quite leggy, so I try to ensure that it gets as much light as possible, and will be pinching out the growing tips shortly, to encourage a bushier plant. 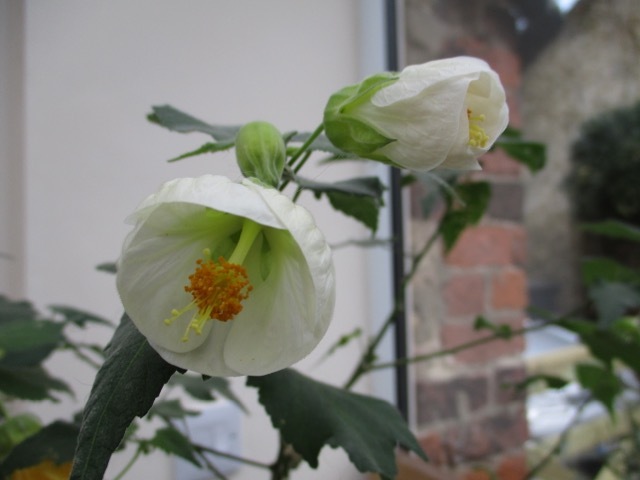 The plants which are the undisputed Queens of the Winter, are the Abutilons. 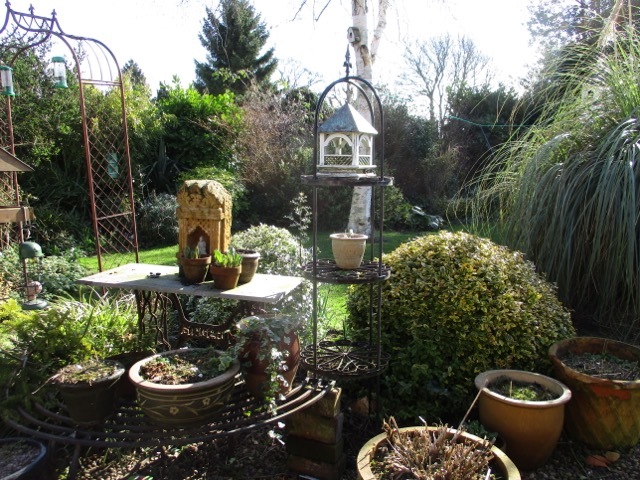 They have flowered non stop all summer, autumn and now winter. The flowers are quite lovely, and the red pictured below is very rich and dark. They are hard to beat for flower power! I grew lots from seed in early summer and have put several in the greenhouse to overwinter, and these are thriving but not flowering. 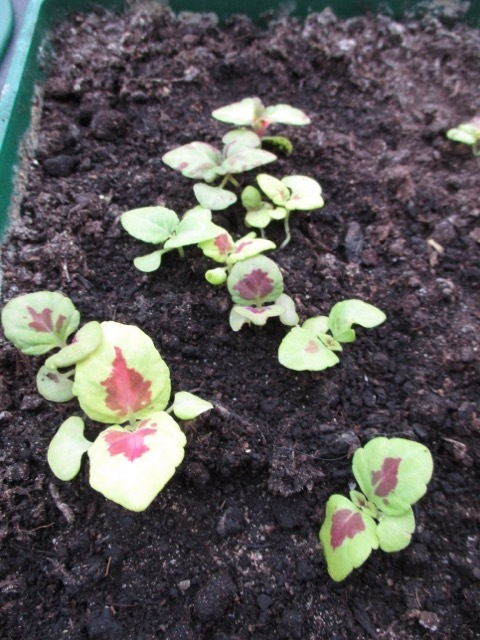 The temperature in the greenhouse has fallen to 3 degrees and they have been fine. 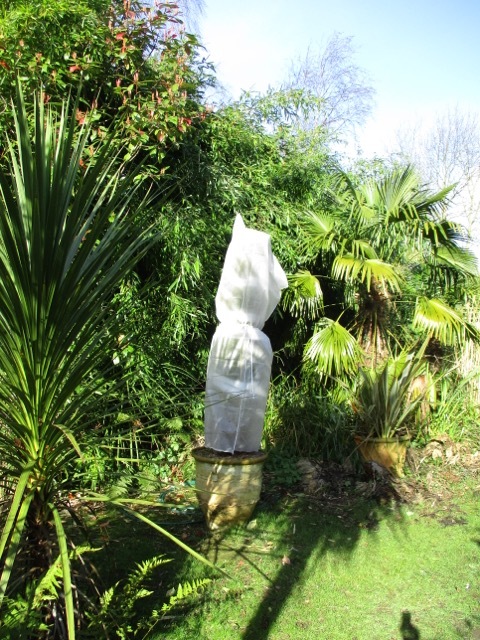 I have left sacrificial Abutilons in the garden, to see what temperatures they can actually cope with, and so far we have had down to minus 3, and they are still fine, and have even kept their leaves. However, last night the temperature dropped to minus 4.8 degrees , so I have yet to see whether they have survived , or succumbed to the frost. 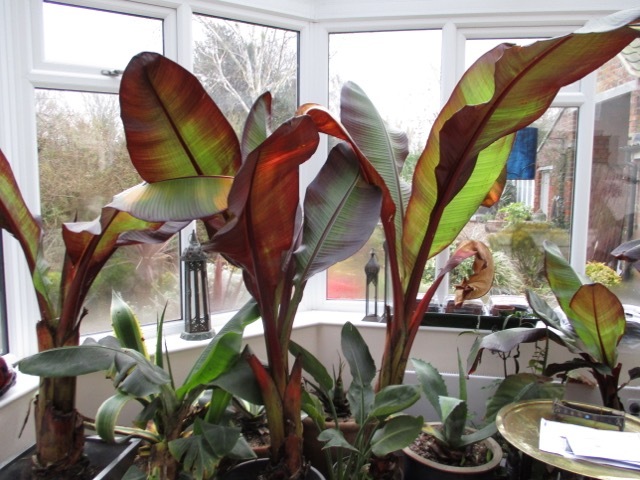 Yet another reason to be cheerful is that the red, Abyssinian bananas are all continuing to thrive and to actively grow, and produce new rollers. They look amazing when viewed against the rays of a winter sun. 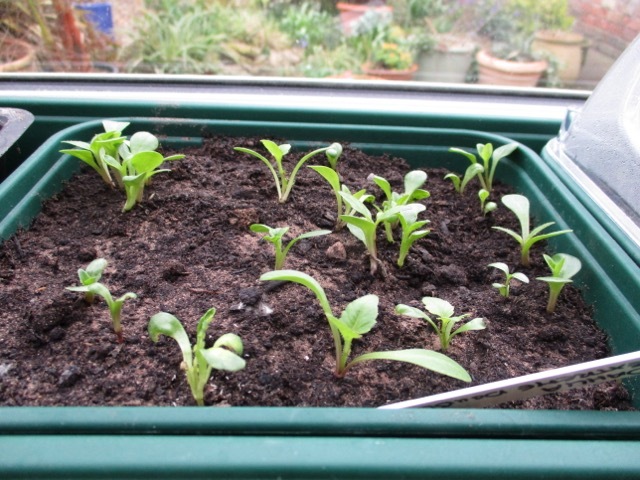 And the best reason of all to be cheerful is that the seeds have been chosen and bought, and the propagator has been switched on. 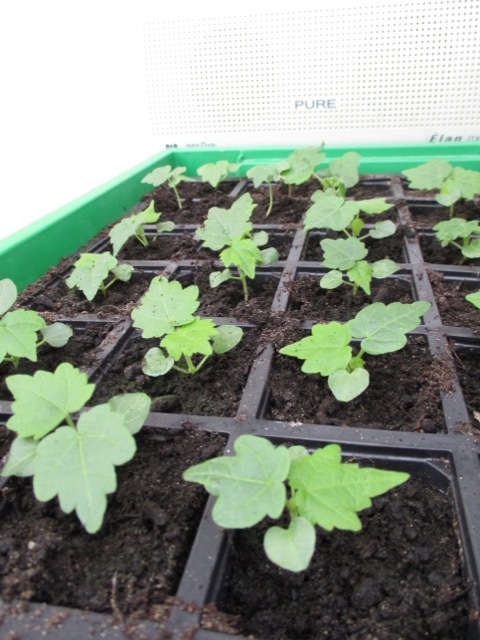 There are already results, with seedlings popping up every day.